Winter in Bishop is one the best times of year for mountain biking in the area. The days are frequently warm and sunny and now as we edge toward spring the daylight hours are getting longer and longer. There are trails and tracks that challenge skill, fitness and even courage. There are leisurely rides and strenuous rides. Some are long and some are short. There are routes that need a shuttle ride and routes that loop you back to where you started. Whenever I have a chance to go for a bike ride, I ask myself a couple of questions. How much time do I have? How hard do I want to work? Am I going alone or with a friend? And … you know what? The answers always point to the perfect ride for the moment. 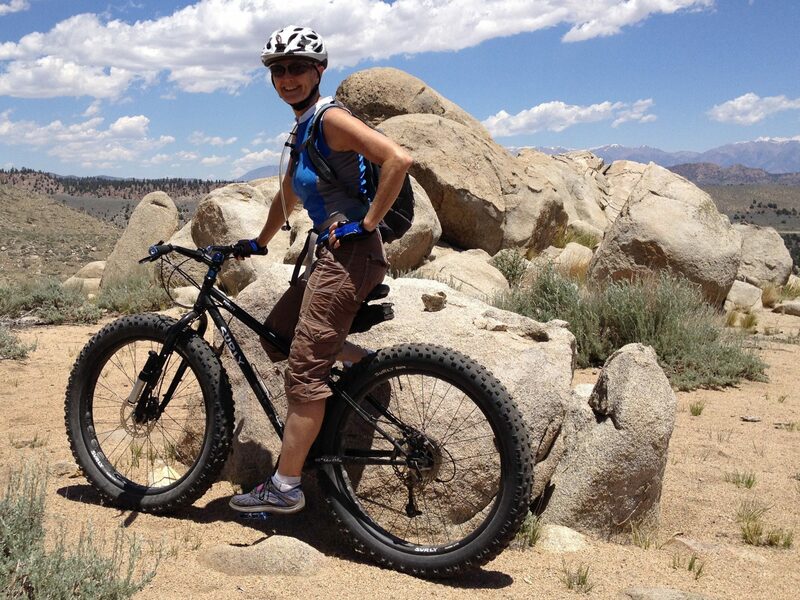 Then I grab the right bike for ride; mountain bike, fat bike, road bike or touring bike. Yup, there’s more than just mountain biking around here, but for now let’s just focus on the MTB rides. Here are six of my favorites that can each be done in just a few hours. 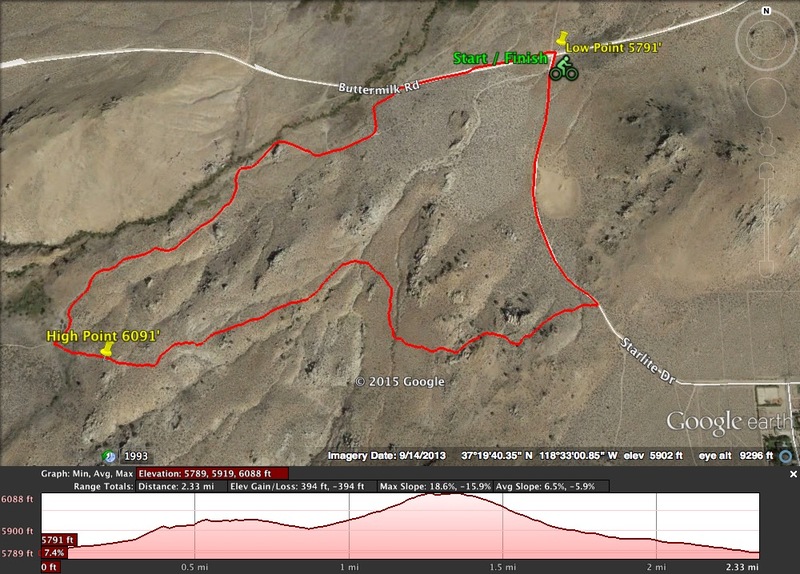 At 11.4 miles long you’ll get all sorts of road, trail, grade & terrain challenges. It’s not highly technical, but there are a few rocky spots where speed changes everything. The faster you ride the more technical it is, but at a slower pace the line appears less demanding. This is a loop ride so you can go it alone or with bike buddies. Head west out of Bishop on Highway 168 then turn right onto Buttermilk road. At precisely one mile along the Buttermilk road take a right turn toward the creek and park in the clearing to your left. Then, with a good stash of snacks and water, and dressed in layers, set out on your bicycle west along Buttermilk road. This is the ‘paying-your-dues’ section and even though it’s a bit of a slog along this washboard it is a great warm up. 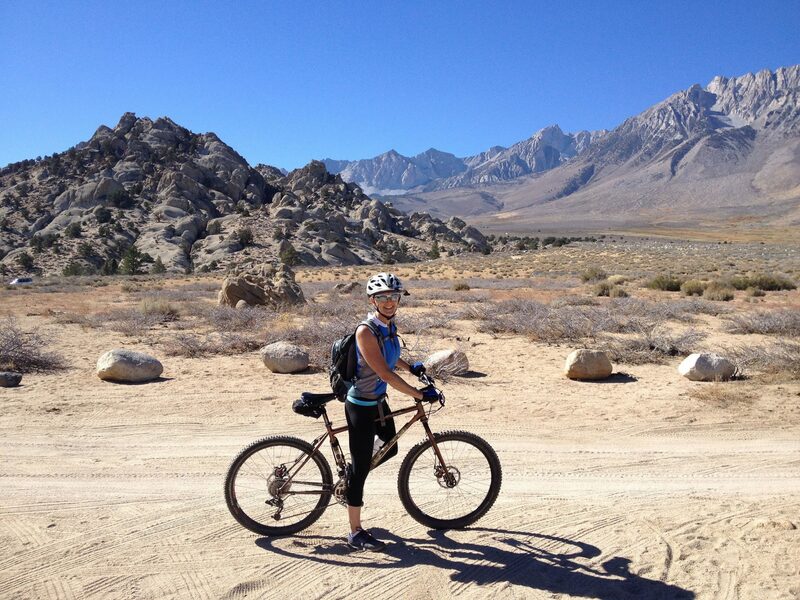 At the Buttermilk Boulders cross the cattle guard and turn right and cycle on past the climbers parking area. 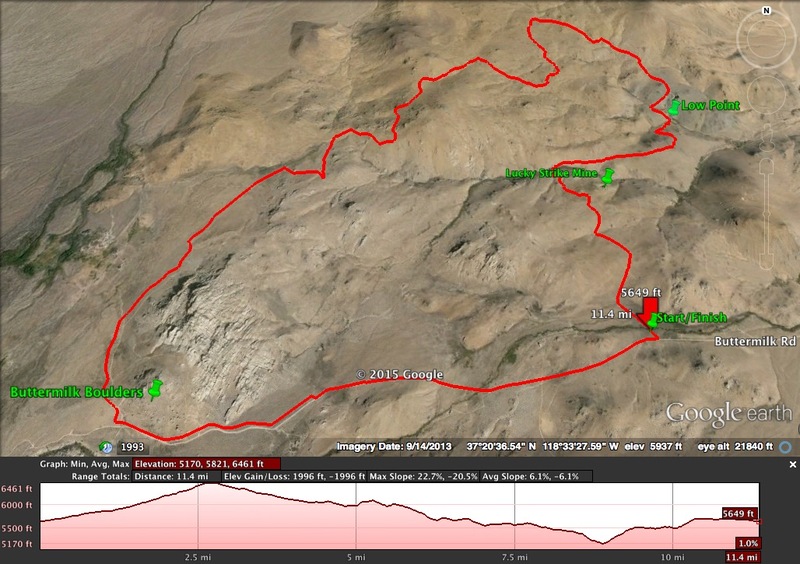 Here comes the first reward – about 2 miles of fun, fast somewhat technical downhill. The trail skirts the western base of the Buttermilk and Tungsten Hills with fabulous views of Mt. Tom. At mile point 4.3 take the fork to the right for a short climb and then … the really good stuff starts! When you see USFS road marker 31E307 look to your left for the super bit of single track that’ll get you rockin’ and rollin’ around this hill. This will shoot you out onto a dual track road that leads to a great overlook. Spot another single track heading east off the turn-around and weave your way around the hills for a speedy 1.5 miles. 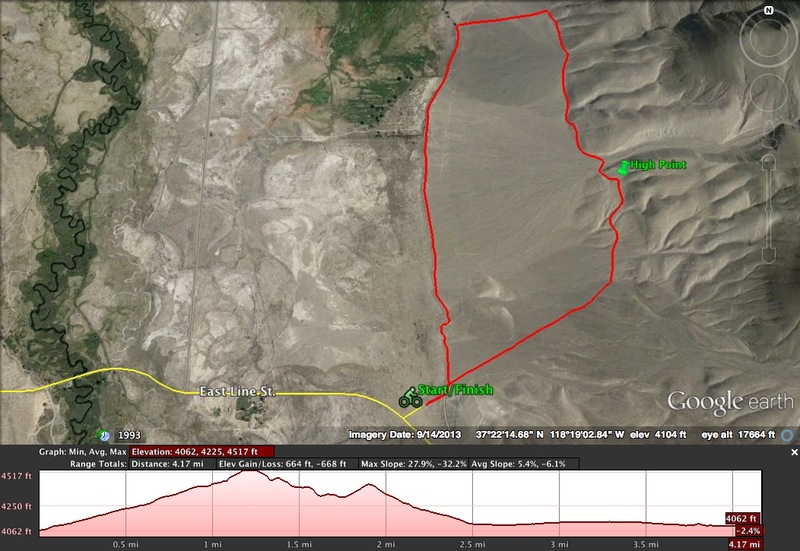 After that keep looping around toward your right and follow the Tungsten road until mile point 8.9. This is the lowest point along the ride and here you’ll need to take a sharp right and climb up over the eastern side of the Tungstens, back toward the Buttermilk road. It’s a steady, but fun climb with a few zigs, zags and dips. The road will deposit you where you started, but not before you have to cross a wet, chilly and perhaps icy creek. If it’s too deep to ford look up or down for a narrower section where you can make a mighty leap and avoid the wet altogether. There are many great viewpoints, old mine sites, and tracks & trails that could lead you astray. Stop now and then, take in the sights, snap a few shots and just breathe it all in. This is a fairly strenuous ride and requires good mountain biking skills. Get out there, be safe and have fun! This is my “whoo hoo” ride. It’s about 10 miles of (mostly) downhill mountain biking that starts just off Highway 168 near Aspendell. With the wonderful winter snowfall we’ve had this year you might want to get your hands on a fatbike. In fact this route is best done on a fatbike because it’s likely that you’ll be cutting some tracks in snow near the top and then you’re going to hit some deep, soft sand toward the end of the trail. It sure can be done on a regular mountain bike though … if you like to slide. Whoo hoo! This route starts opposite Intake II and you may need a 4×4 vehicle to get you to the start point if there’s snow on the ground. Remember to dress in layers. You should also bring a friend along who isn’t keen on the bike ride to drive the vehicle back to the end point. It’s a gorgeous drive with marvelous views and everyone will have a good time. Here’s the plan. Head east out of Bishop on Highway 168 toward Aspendell. Drive 14.5 miles and just when you see the lake and parking lot down to your left … slow down! … and look to your right for a dirt road heading up onto the moraine. Turn right and follow the road for about 500 feet and park in the clearing to your right. Pile out of the car, make sure to give the keys to your designated driver, off load your bikes, hop on and get cycling up the road as it continues up the moraine beyond the clearing. It’ll be a leg and lung buster of a warm up, but oh the fun you’ll have on the way down! Here’s an alternate plan if the snow is too deep. Hop onto the trail at either of the pipeline access points along Highway 168. 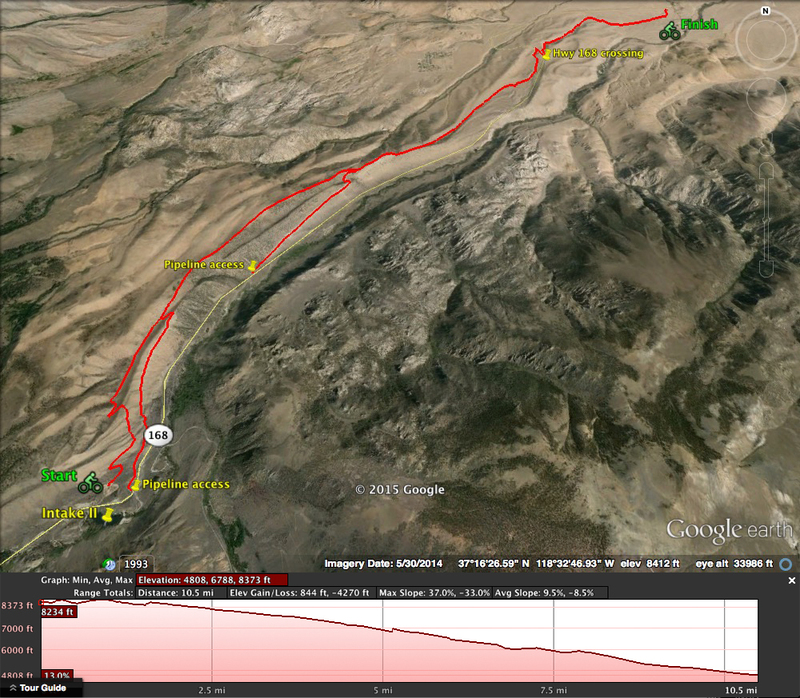 Ride up the road alongside the pipeline then head up onto the moraine crest and follow the route from there. 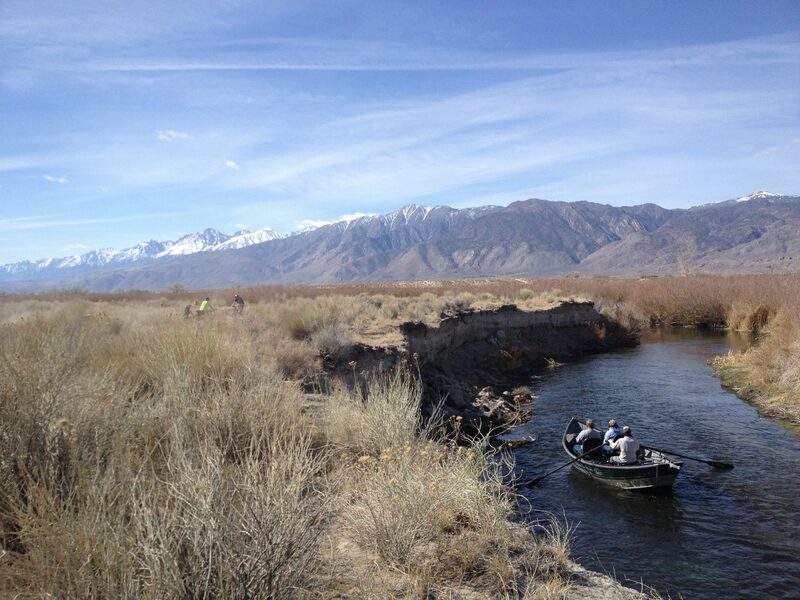 Take a leisurely bike ride along the banks of the Owens River. In summer this life-giving river creates a verdant path in a hot and arid landscape that nourishes the fauna and flora of the high desert. In winter it offers a reprieve from the chilly mountaintops and blustery canyons that flank this expansive valley. Perhaps you know that fishing is allowed year-round along the 40 river-miles from Pleasant Valley Dam to Tinemaha Reservoir. But do you know that it also has miles of undulating trail and track along its banks that’s just perfect for bike riding? 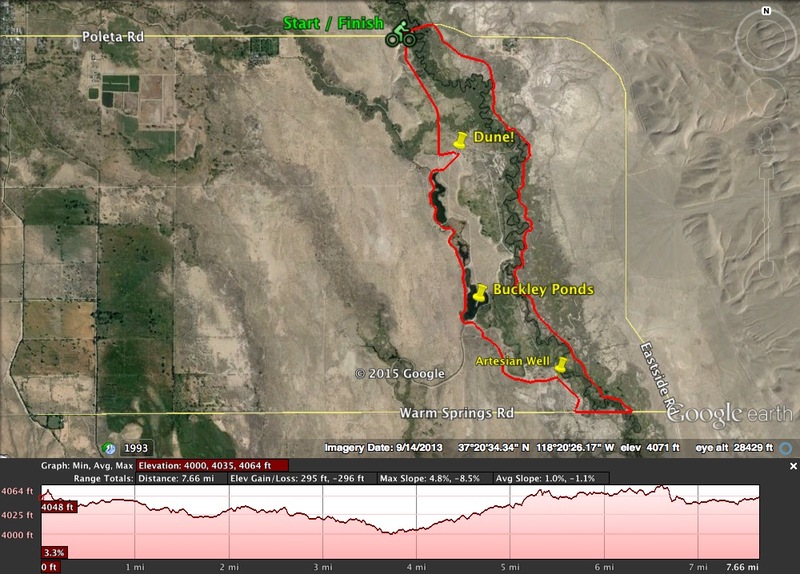 Between the 2.5 miles of straight line distance between Poleta Rd (East Line St) and Warm Springs Rd is a sinuous section of the river where a bike ride on a typical winter day in Bishop is simply stunning. This is the ride I take as a relaxation ride, or when I have family or friends visiting who don’t care to exert themselves quite so much. There’s not much elevation change so it is a pleasant ride and fun for the whole family. Everyone should have a reasonable level of fitness and basic bike handling skills, as it can get a little energetic in places. 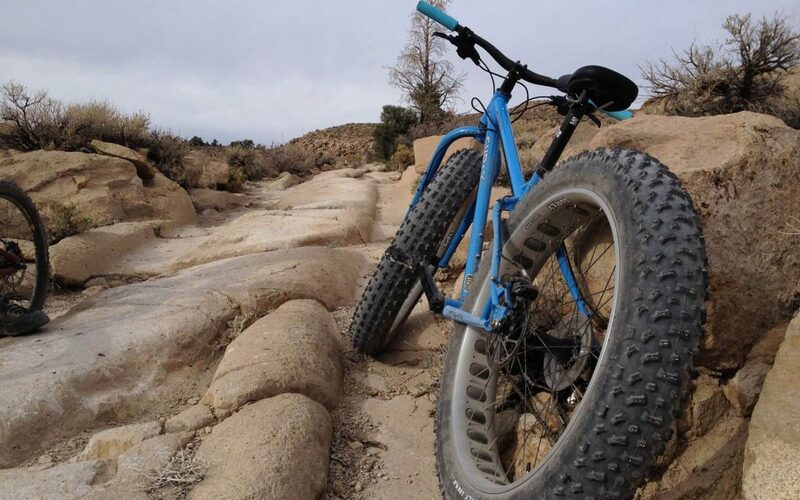 Fat bikes make this route a really easy ride and a mountain bike will provide a bit of a workout. This route has diverse terrain – soft sand, short grass, hard-packed dirt, paved road and a sand dune! It also skirts the beautiful Buckley Ponds where there are places to stop and rest and enjoy a snack. See red tail hawks soar above the plain and great blue herons rise languidly from the tall reeds along the banks. Ah … this is a ride that restores my soul and lifts my spirits. With so many excellent and easily accessible trails nearby there is plenty of time to get in a bike ride before dinner on any given day. The Starlite Loop is not too long and has super features that will get your body warm, your blood pumping and your legs working. I love this trail for it’s twisting, undulating single track. It has commanding views of the Buttermilk Country, Mt Tom, the Tungsten Hills and the tablelands. The boulders are big, the sand is soft, and the Pinyons up here offer a hint of forest. Take Highway 168 west out of Bishop and turn right onto Buttermilk road. Drive 1.7 miles to the intersection with Starlite drive, turn left and park just off the dirt road. Remember … don’t crush the brush! Start the ride with a short, sweet climb (if you like a kicker to get you going) up the hill toward Starlite. In .4 miles, just as you crest the rise and see Starlite up to your left, you’ll see the single track veer off to your right. Take it! 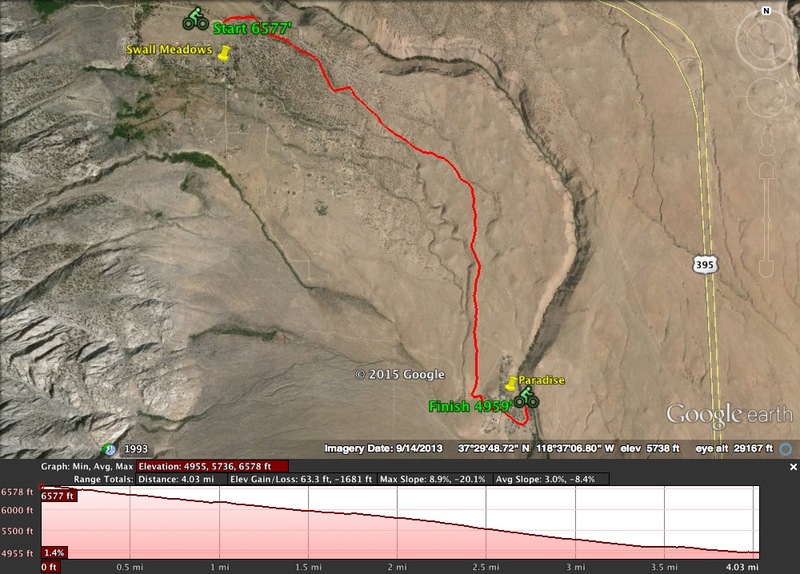 Follow this undulating trail for 1 mile then turn right at the junction with an obvious dual-track. Now you’re on your way down to where you started. It’s a good go-it-alone loop that doesn’t take too long … just right to work up a little appetite for dinner. 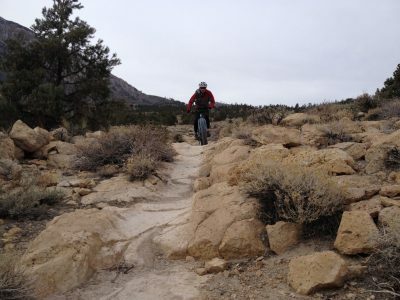 Did you know there’s slickrock riding in Bishop? Yup! Not only that, but it’s an incredibly interesting piece of Owens Valley history. Ride the Wagon Wheel trail from Swall Meadows to Paradise. This historic track was cut into the Bishop Tuff by mule trains hauling mineral rich ore from the mines almost 100 years ago. It’s a short 2.5-mile stretch of rough and rocky trail with a good measure of sand thrown in for an exhilarating downhill run. Extend the ride by starting above Swall Meadows and weave down a narrow, sandy canyon for about a mile (be careful at the road crossing) then out onto the wide bluff that drops over 1,000 feet in those 2.5 miles of technical terrain. Then hop onto the old Sherwin Grade road and coast the last .5 miles to the Lower Rock Creek trailhead. All-in-all it’s a fabulous 4-mile ride that anyone with a reasonable bit of mountain biking experience can do at an easy pace. But … it’s most fun to ride it fast and this requires pretty good technical skill and a small measure of courage. I learned an invaluable lesson on this ride once. Don’t finger the brakes! Whoops. Here’s the story. I’m heading fast down a section of slickrock steps on a fatbike (which, incidentally bounces like a beach ball on a hard surface), when a good bounce throws my feet off the pedals. Well … I just couldn’t stop my hands from grabbing the brakes and then everything went into slow motion. “Don’t squeeze the brakes,” my brain yells to my hands. “You gotta be kidding me,” my hands scream back. Front wheel locks. Back wheel lifts off. I fly over the handlebars and execute a less-than-graceful forward somersault as the bike cartwheels behind me. Hey … I even stuck the landing thanks to my gymnastics training. No harm done to either my bike or me. Always wear a helmet. BTW – I still like this trail best on a Fat Bike! This is the ultimate favorite of my favorites. FYI – You may want to arrange for a shuttle to the top. I’ll admit that I do this ride with a friend. Riding the trail uphill is arduous at best and I prefer the road on a road bike. 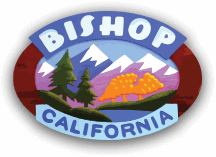 Winter in Bishop is true to form this year – unpredictable. However, most days are warm and sunny with highs fluctuating between the 60s and 70s. It’s perfect for a quick mountain bike ride to keep you in form for … well, just about anything. 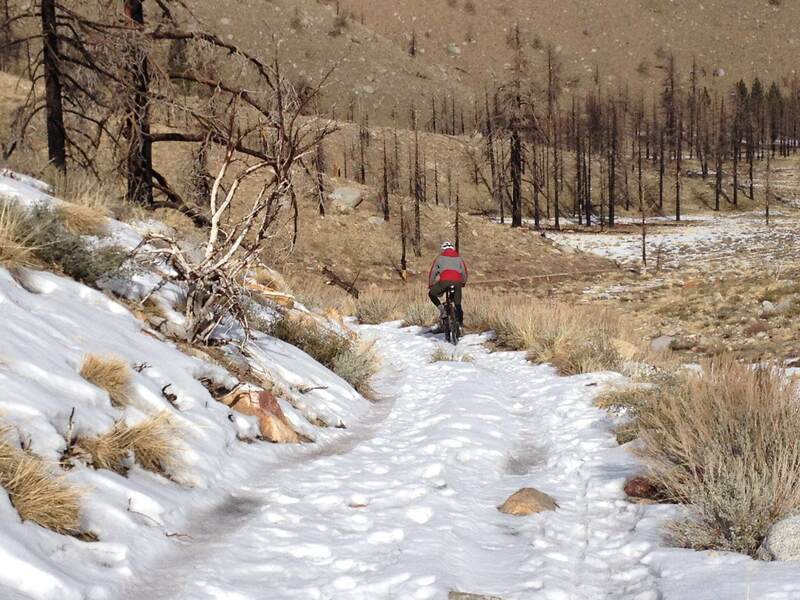 There’s a super little single-track trail east of Bishop at the base of the White Mountains below Silver Peak. A short 4.3-mile drive from the center of town on East Line Street will take you the ride start point. Once you’ve crossed the Owens River and passed White Mountain Research Station the road begins to curve right – take a left turn and park in the clearing to your right. After you’ve hopped on your bike continue up that road for about 500 feet and turn left to head due north. A few feet further along on your right you’ll spot a trail that heads northeast in a pretty straight line up over the alluvial fan to the base of the foothills. At mile .83 you’ll cross an intersection of a couple of trails, keep the sloping alluvial fan to your left and the rippling foothills to your right with a bearing due north. Climb another 150 or so feet … then let ‘er rip. The trail will turn you back toward the dry canal for an easy cruise back to your car. Be aware that this is also dirt bike terrain so please listen out for motorized trail users and watch for dust plumes. The trail has some significant whoops along it. Not quite a pump track, but you’ll get a workout. Finding the trails and tracks around Bishop can be a little confusing. 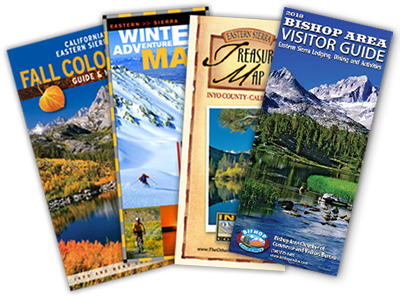 There are many resources such as online sites, general area maps and bike stores with knowledgeable folks to help. However, there’s no central resource and it requires a little investigation to know what’s available and where to go. Here are visual map guides for a general overview each of these routes. You can also download the GPX tracks I’ve created to upload to your phone or GPS device. This is of course not an exhaustive list and I’m working on more routes in the nearby area and further (higher) afield. Oh boy, oh boy … there’s so much more out there. A last note! Be careful. Always dress in layers. Tell someone where you’re going and when you expect to be back. Please keep to existing trails and roads. Most important of all … have fun!